Bedok Sports Hall, Monday, April 21 , 2014 — Singapore Sports School (SSP) held the lead in the first three quarters, only to lose hold of it in the last quarter as CHIJ Secondary (Toa Payoh) edged them 31–28 to win the National C Division Netball Championship for the second year running. Sports School had earlier lost 40–28 to CHIJ in the second round. They did not make it beyond the semi-finals in 2013. The first quarter began with CHIJ potting in the first goal within the first 10 seconds. SSP scored four successive goals in reply. 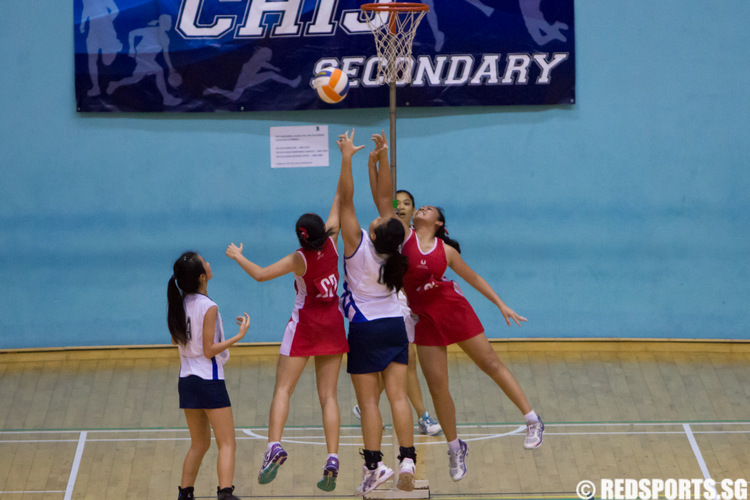 CHIJ displayed a nervousness that saw their shooting and passing fall short. SSP led 10–6 after the first quarter. The second quarter saw better defense by both teams. CHIJ saw a marked increase in their passing and shooting accuracy despite the pressure of defending the championship title with their supporters looking on. CHIJ outscored SSP 10–7 in the quarter and trailed by just one (16–17) heading into the half-time break. It was an even third quarter, with both sides scoring eight points each, allowing SSP to take a slim 25–24 lead heading into the final quarter. The last quarter was a test of will and fighting spirit. CHIJ upped their game with better chemistry among the team players and the climax of the game came when CHIJ caught up and took the lead at 26–25. By now, the crowd was on their feet with each point scored. CHIJ eventually outscored SSP 7–3 in the final quarter to seal a 31–28 win to successfully defend their title. “It was amazing that we came back in the last quarter and it really shows that nothing is really decided until the final whistle is blown. We were a bit worried about the communication on court but today, we really did very well.